Home»LED Lights»Rocker Panel LEDs » Strobes N' More SideWinder Dual Color Running Board Light - NEW! We expect to start shipping these to our customers in late April. Please consider this when placing your order. 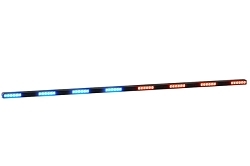 Introducing the BRAND NEW Strobes N' More SideWinder Running Board LED! 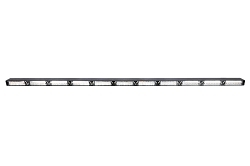 The SideWinder linear optics provide that extra warning power needed when clearing intersections/blocking lanes with an extra wide lighting angle from 16 degrees upwards and 8 degrees downward (we suggest you mount it upside down to have the best optical performance.) Utilizing the modular design for easier shipping, the SideWinder is sleek and low-profile with a high light intensity and features dual color mode and 15 flash patterns. It has a tough, anti-corrosive and water-resistant thermal plastic that provides excellent heat dissipation. The flood option allows you to use the light as an auxiliary alley light or a courtesy light when opening your door for additional visibility and can be dimmed by 50%.